According to the Pakistani “Business Record” report, from July to November 2015, Pakistan’s cement industry‘s domestic and international sales increased by 5.5% year-on-year, of which domestic sales increased significantly to 12.2 million tons, an increase of 15.64% over the same period of last year. 3.45 million tons fell to 2.56 million tons, a decrease of 25.73%. The Pakistani cement industry is characterized by external cold and internal heat. On the one hand, it reflects the rapid growth of the real estate, transportation and other infrastructure areas in Pakistan and has a great potential. On the other hand, it also reflects the decline in the competitiveness of Pakistani exports. From a single month’s point of view, it also showed consistent characteristics. In November, the overall sales volume of the Pakistani cement industry increased by 11.49% year-on-year, of which sales in the domestic market increased by 20% to 2.84 million tons, and exports decreased by 19% to 530,000 tons. Camelway Machinery has exported several sets of concrete batching plant to Pakistan. The operation is stable and we can contact us if necessary. 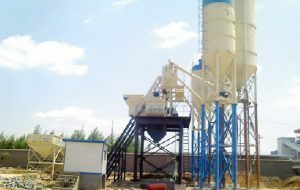 This entry was posted in News and tagged Camelway Machinery in Pakistan, concrete batching plant in Pakistan by camelway. Bookmark the permalink. What is the Reason of slurry leakage in mixer shaft end ?